The image beneath is from Kieran McConville's Big Book - a personal collection of newspaper clipping relating to Creggan Parish 1748-1914 that he was kind enough to share with me on my most recent trip to Ireland. STATUTE TO COUNTY ARMAGH MAN. 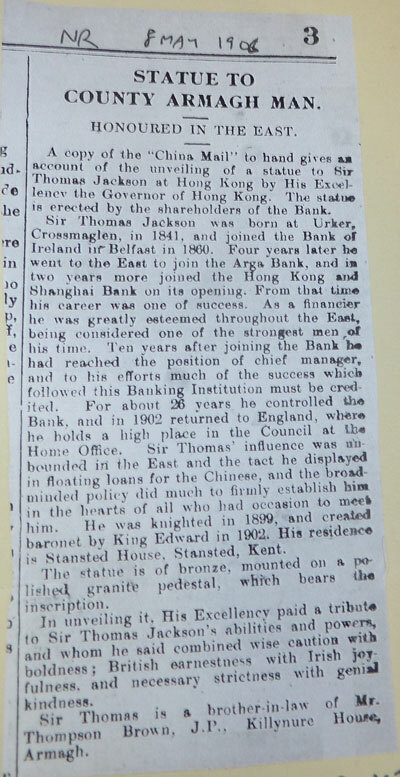 A copy of the China Mail to hand gives an account of the unveiling of a statue to Sir Thomas Jackson at Hong Kong by his Excellency the Gov. of Hong Kong. The statue is erected by the shareholders of the bank. Sir Thomas Jackson was born at Urker, Crossmaglen, in 1841, and joined the Bank of Ireland in Belfast in 1860. Four years later he went to the East to join the Agra Bank, and in two years more joined the Hong Kong and Shanghai Bank on its opening. From that time his career was one of success. As a financier he was greatly esteemed throughout the East, being considered one of the strongest men of his time. Ten years after joining the bank he had reached the position of chief manager, and to his efforts much of the success which followed this banking institution must be credited. For about 26 years he controlled the bank, and in 1902 returned to England, where he holds a high place in the Council at the Home Office. Sir Thomas's influence was unbounded in the East and the tact he displayed in floating loans for the Chinese and the broad-minded policy did much to firmly establish him in the hearts of all who had occasion to meet him. He was knighted in 1899, and created baronet by King Edward in 1902. His residence is Stansted house, Stansted, Kent. The statue is of bronze, mounted on a polished granite pedestal, which bears the inscription. In unveiling it, his Excellency paid tribute to Sir Thomas Jackson's abilities and powers, and whom he said combined wise caution with boldness; British earnestness with Irish joyfullness and necessary strictness with genial kindness. Sir Thomas is a brother-in-law of Mr. Thompson Brown, J.P., Killynure House, Armagh.